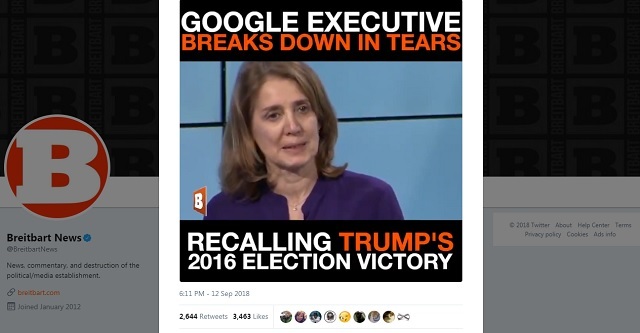 Bombshell leaked video released by Breitbart on Wednesday shows top Google executives crying over Donald Trump's 2016 election victory and promising to create "artificial intelligence" systems to combat "misinformation" shared by "low-information voters." They've put all this censorship into practice and more. They've banned or heavily demoted nearly all alt-media sites from Google search results and they've rigged YouTube search results to favor only major media propaganda outlets. They also banned Alex Jones and hundreds if not thousands of other right-wing channels for so-called "hate speech" and other nonsense (America does not have hate speech laws). This is criminal interference in our election and dystopian social engineering far beyond George Orwell's 1984. If these companies are going to work in concert with the Democrats, the SPLC and the ADL to wage war on America and our First Amendment rights, then they need to be broken up, regulated into the ground or outright nationalized!